» Researchers use graphene to synthesize "polymer carpets"
Researchers use graphene to synthesize "polymer carpets"
Researchers from Tomsk Polytechnic University, along with additional international colleagues, have discovered a method to modify and use graphene without destroying it. Thanks to the method, the researchers were able to synthesize a well-structured polymer with a strong covalent bond on single-layer graphene. The researchers call the result "polymer carpets". The structure is highly stable and less prone to degradation over time, holding promise for the development of flexible organic electronics. If a layer of molybdenum disulfide is added over this "nanocarpet," the resulting structure generates current under exposure to light. Professor Raul D. Rodriguez, from the Research School for Chemistry & Applied Biomedical Sciences, says, "When functionalizing graphene, you should be very careful. If you overdo it, the unique properties of graphene are lost. Therefore, we decided to follow a different path. In graphene, there are inevitable nano-defects, for example, at the edges of graphene and wrinkles in the plane. Hydrogen atoms are often attached to such defects. It is this hydrogen that can interact with other chemicals." 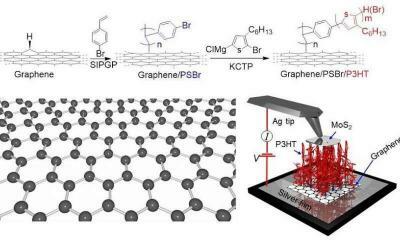 To modify graphene, the authors use a thin metal substrate on which a single graphene layer is placed. Then graphene is covered with a solution of bromine-polystyrene molecules. The molecules interact with hydrogen and are attached to the existing defects, resulting in polyhexylthiophene (P3HT). Further exposed to light during the photocatalysis leads to the development of a polymer. "In the result, we obtained the samples with a structure resembling 'polymer carpets,' as we call them in the paper. Above such a 'polymer carpet,' we place molybdenum disulfide. Due to a unique combination of materials, we obtain a sandwich structure that functions like a solar battery. That is, it generates current when exposed to light. In our experiments a strong covalent bond is established between the molecules of the polymer and graphene, which is critical for the stability of the material obtained," notes Rodriguez. According to the team, this method for graphene modification produces a very sturdy compound; it is also simple and cheap, as affordable materials are used. The method is versatile because it makes growing very different polymers directly on graphene possible. "The strength of the obtained hybrid material is achieved because we do not destroy graphene itself, but use pre-existing defects and a strong covalent bond to polymer molecules. The study is promising for the development of thin and flexible electronics in which solar batteries can be attached to clothes, and when deformed, will not break," the professor says.